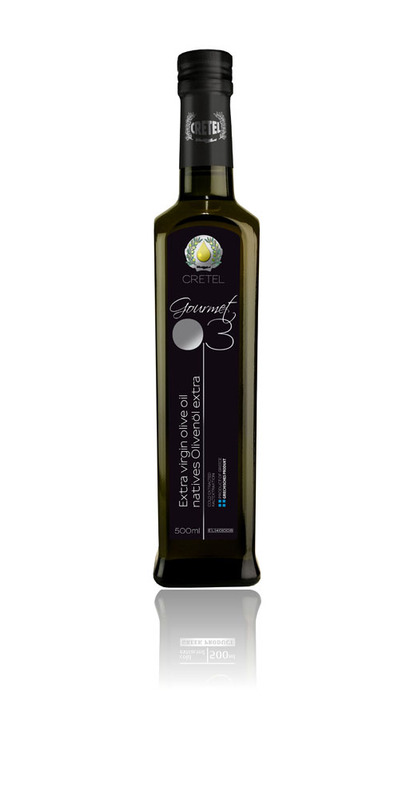 The extra virgin olive oil “Cretel Gourmet 0.3” is the result of our company’s ongoing endeavour to produce superior products. The acidity level of this olive oil hovers near zero, since special efforts have gone into the cultivation, collection, and pressing of the olives it comes from. Its low acidity, in combination with its abundant organoleptic traits, richness in Vitamins E & A, high content in monounsaturated fats, and pure, vivid fruitiness are the elements that give “Cretel Gourmet 0.3” its competitive edge. Available in dark, glass, “Danae” bottles of 500ml.